WHEN Dane Gagai was brought down to Newcastle in 2012 he didn't think much of the Hunter city. 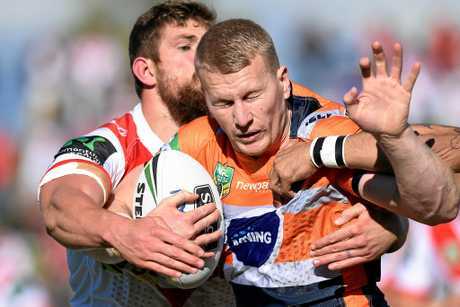 He flew down for one day to meet then-Knights coach Wayne Bennett and take a look around, to see if the club was a good fit for his blossoming career. He ummed and ahhed, but eventually gave in to the lure of playing under supercoach Bennett. 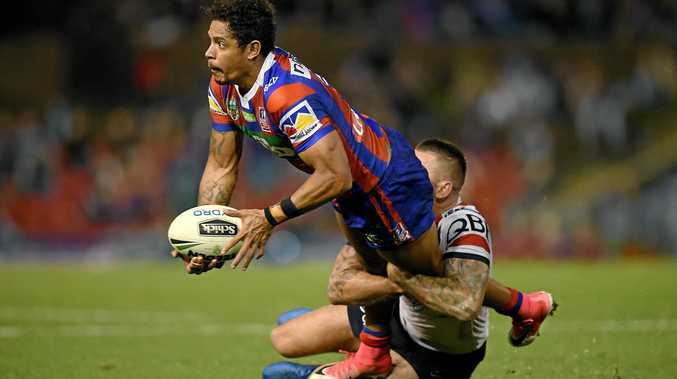 Gagai admits he almost never returned to Newcastle. And it was a bizarre mistake from the club that almost cost it a future representative star. "When I came here they actually didn't take me to the nicest part in Newcastle and I was only here for the day," Gagai said. "I didn't know too much about Newcastle to be honest, I didn't think it was the nicest place. "I was contemplating what I wanted to do and I said 'I'll give it a shot, I'll play under Wayne, can't go wrong there'. "Then when I got here a few of the boys took me down to Mereweather and I thought they should probably bring players down this way a bit more - show them the nicer side to Newcastle. "It's such a good town and the fans are unbelievable." While Gagai was far from rapt with Newcastle upon first inspection, he's grown in love with the steel city in the five years since packing up and shipping south from Brisbane. And it's that lifestyle that the Origin star says the NRL club should be using to sell the famous blue and red strip to prospective recruits. Without the lure of the game's most experienced coach, and with a dearth of on-field success in recent seasons, the sales pitch may be in danger of falling short. But Gagai says Newcastle the city is enough of an attraction to lure quality to the football club. After all, it's worked its charm on him. "I guess it's what type of lifestyle you want to live, and you want to be happy outside of footy as well," Gagai explained. "That's when most players play their best, when they've got a lot of things going right for them outside footy, and I find Newcastle a nice place to live. "It's chilled, I've taken up surfing since I've been here, and I've always loved the beach, loved the water. "The positive is you don't have the traffic to contend with, or high mortgages and big rents. "A lot of the boys like playing golf and we've got some good-quality golf courses in Newcastle. "Down at the beach at the surf house there's a nice view right on the water where you can grab some lunch and a coffee. "It's a nice part of the world to live, that's for sure." Coach Nathan Brown was handed a grenade when he took the reins of Newcastle last year, but he's been working tirelessly to put things right. The salary cap is under control and the club is now focusing on recruiting some high-end talent to the NSW central coast. So far they've landed young gun Kalyn Ponga. But on the flipside the Knights have missed out on the signatures of Test prop Matt Scott and premiership utility Jack Bird by the skin of their teeth. Whatever Brown and the recruitment team is trying to achieve, Gagai says the playing group has total faith in the direction the club is heading. That faith has been nurtured through the recruitment of lesser-light players, rather than the big names that have slipped the net. "We obviously believe in what Browny's doing and the people he's brought in," Gagai said. "You've got to remember he brought in Mitch Barnett who wasn't a full-time first-grader (at Canberra), and now he's in our starting side and he's one of our best players. "He's done that with a couple of players - not just Mitch Barnett, but he's brought Brendan Elliott, Jamie Buhrer, Rory Kostjasyn, who brings a lot of leadership and brings out the best in our younger players. "He looks at the whole package, so when he does bring in a player that's playing well for us it does give you confidence for the future." Matt Scott and Jack Bird are out of the picture - signed by the Cowboys and Broncos respectively, having dodged Newcastle's pursuits. But that isn't stopping Brown and the Knights going after that elite signing. Kiwi halfback Kieran Foran was said to be in the club's sights, and Brown admitted this week he'd met with the Warriors playmaker. Gagai says landing that "big fish" would be a coup for the club and a shot in the arm for a playing group trying their heart out each week. "It is good when you do sign those key players, you do get excited for it. When you do get those key signings it obviously boosts the confidence in the team," he said. "Not only that, when you bring in a key player it means there's another position taken so it makes the playing group stronger because people want to keep playing in the NRL, it makes your club stronger. "It's no surprise (Foran is) a world-class player, he's been proving that since he's been back in the NRL. "He's a quality player and would add a lot of value to any team he goes to."